You’ve probably never thought much about buttons before. I’ll admit I hadn’t. Besides their practicality there is little to consider for most people. However, buttons have held an important place in garment manufacture and personal presentation for many centuries. Take for example the picture above. This coat, a typical example of menswear à la mode français from the late eighteenth century, is beautiful in it’s own right and made from a stunning brown patterned silk. But looking closer you can see that there is more to this coat than just it’s fabric. 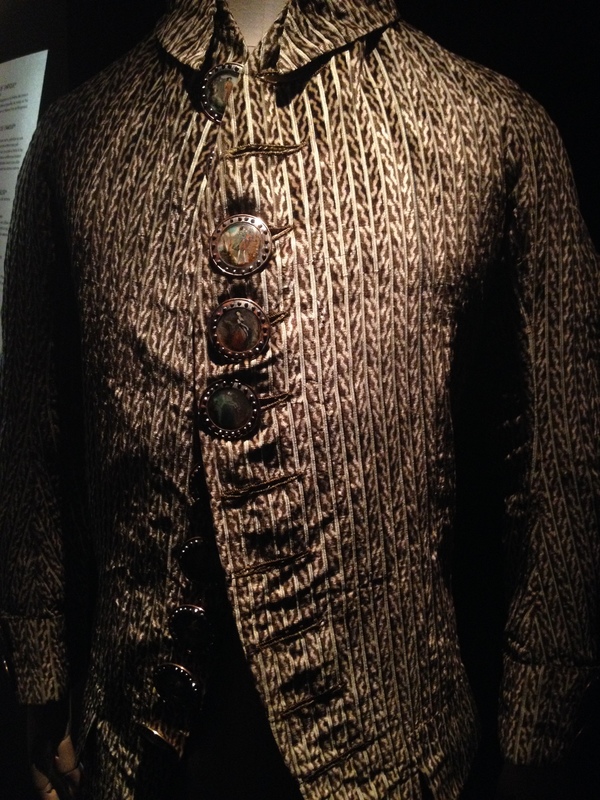 The very pronounced buttons at front, containing miniature portraits and pastoral scenes, were not only practical but also extremely decorative and evocative of the original wearer. Who were the people in these portraits? A wife? A lover? Family members? Possibly even the wearer himself? And why did the wearer choose such decoration usually reserved for more intimate accessories such as lockets, and to display it so prominently? 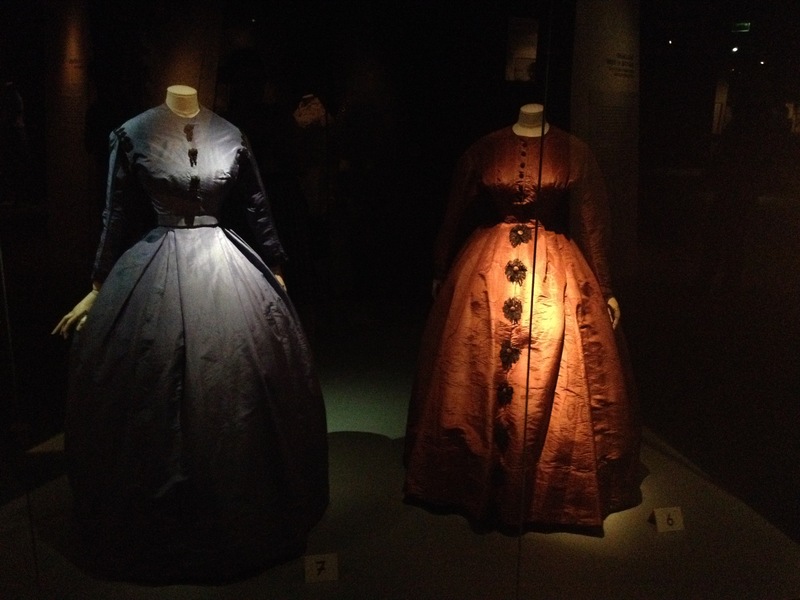 These sorts of questions sprang to my mind as I walked through Musée des Arts Décoratifs viewing their newest exhibition – Déboutonner la mode. 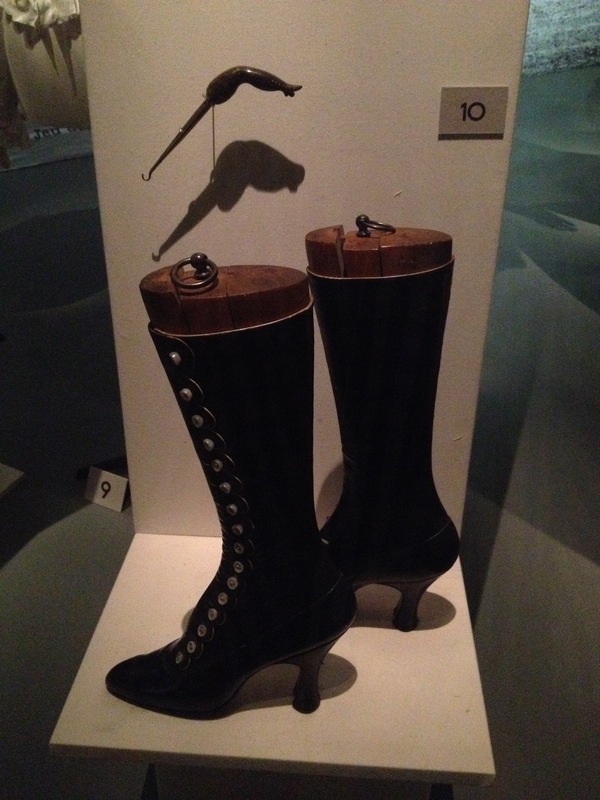 Curated by Véronique Belloir from the 20th century collections department at Palais Galliera, musée de la Mode de la Ville de Paris. Firstly I must say that I love the overall design of the exhibition space. Spread over two levels, when you first walk into the space it is quite dark. For much of the exhibition you are essentially walking around in darkness except for the soft yellow lighting illuminating the exhibition pieces and their labels, which really does achieve the desired effect of drawing your focus to them. Too many times I’ve been in a bland, white walled exhibition space where my attention has wandered to corners of the room that do not contain any of the exhibition pieces. In fact I didn’t even see the museum staff that monitored one section of the space until I saw a shadow moving around in a dark corner of the room! The only downside to this design is that if you’re quite tired when you enter the space you may be even more so by the time that you leave it. It is interesting that the museum website lists the exhibition designer is Éric Benqué. 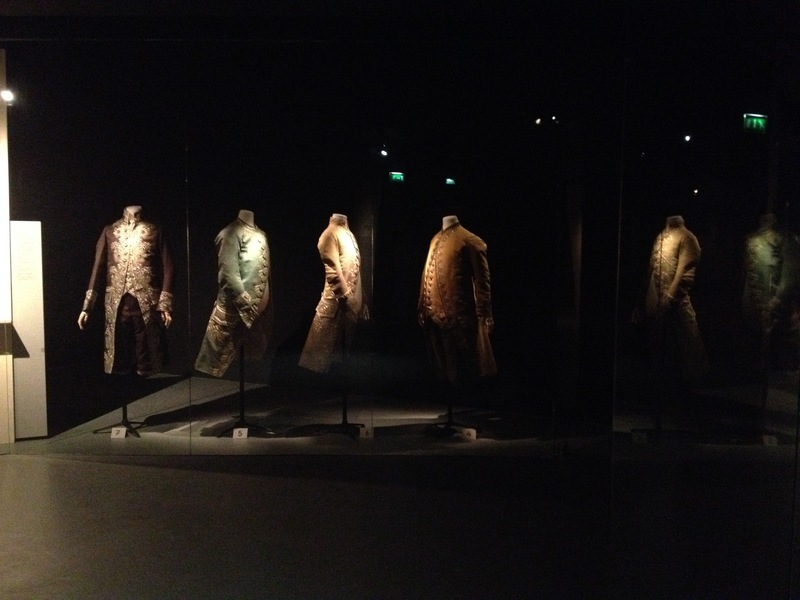 A quick view of his portfolio tells me that he was not involved with the previous 2013 exhibition La Mécanique des Dessous: Une histoire indiscrète de la silhouette, which I was lucky enough to view in New York at the Bard Graduate Centre under the name, Fashioning the Body: An Intimate History of the Silhouette. Yet the design of the exhibition – particuarly the use of low lighting, as well as the overall mood – is strikingly similar. I’d be interested to know then how much of this is dictated by Les Arts Décoratifs and how much by the actual exhibition designer. However, if this is keeping with the museum’s general textile and fashion exhibition style then I thoroughly approve of sticking to a good concept. 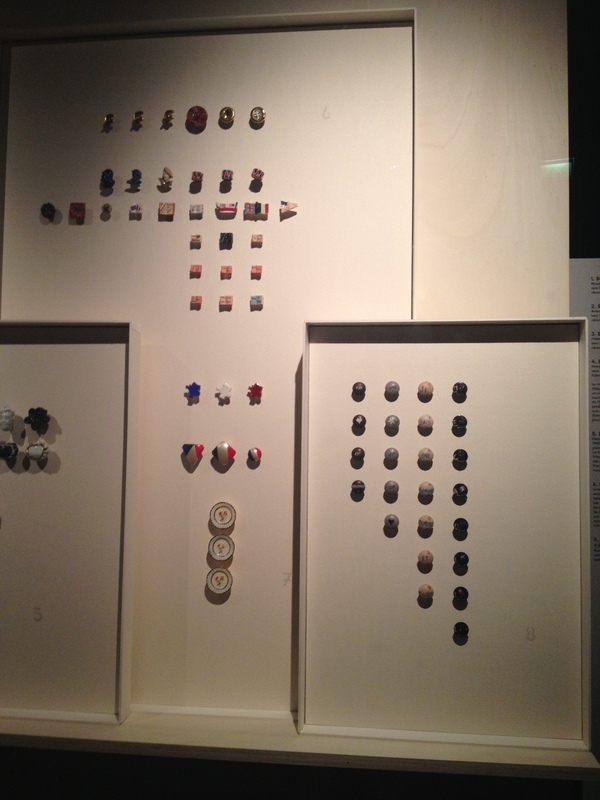 The exhibition begins with an emphasis on materials – what have buttons been fashioned from over the years? Multiple buttons from a variety of centuries are used to demonstrate this – from carved wooden faces to ceramic asparagus bunches. The history of the manufacture of buttons in France from the seventeenth century onward is explored, discussing the often complex guild system that determined what artisans were allowed to manufacture what types of buttons and with what types of materials. 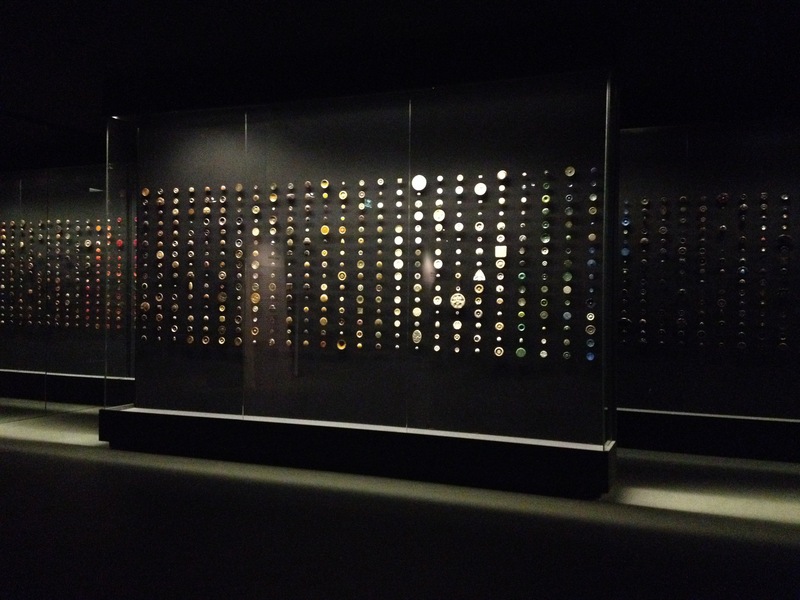 New innovations that impacted the manufacture and use of buttons are discussed, and the exhibition charts their use as functional objects through to decorative and delicate accessories. Most of the labels are in both French and English, which actually surprised me as the labels in the Louvre are just in French, which is great for those non-French speaking visitors. Overall, the exhibition follows a chronological timeline – starting in the mid-eighteenth century and finishing with modern day collections. 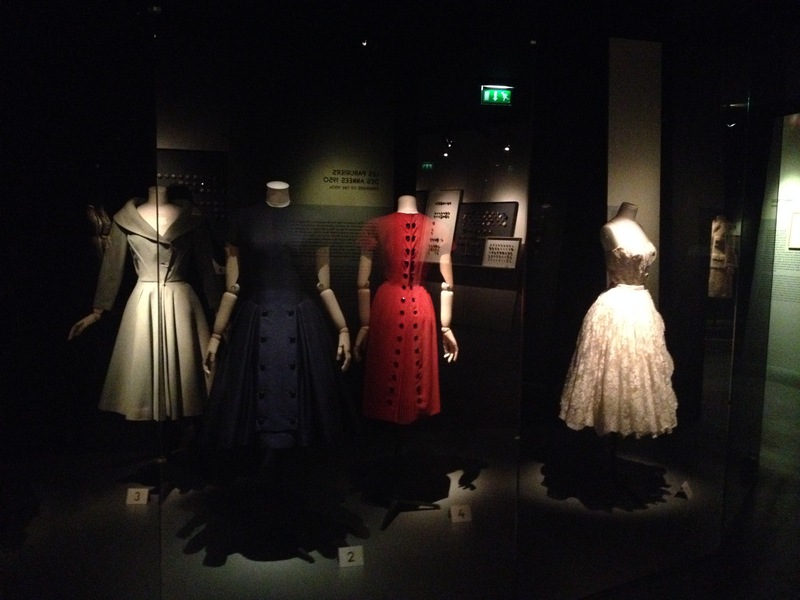 Buttons and fashion post-1950 are shown through the lens of the big French fashion houses that emerged in mid-twentieth century, such as Christian Dior and Jean Paul Gaultier. 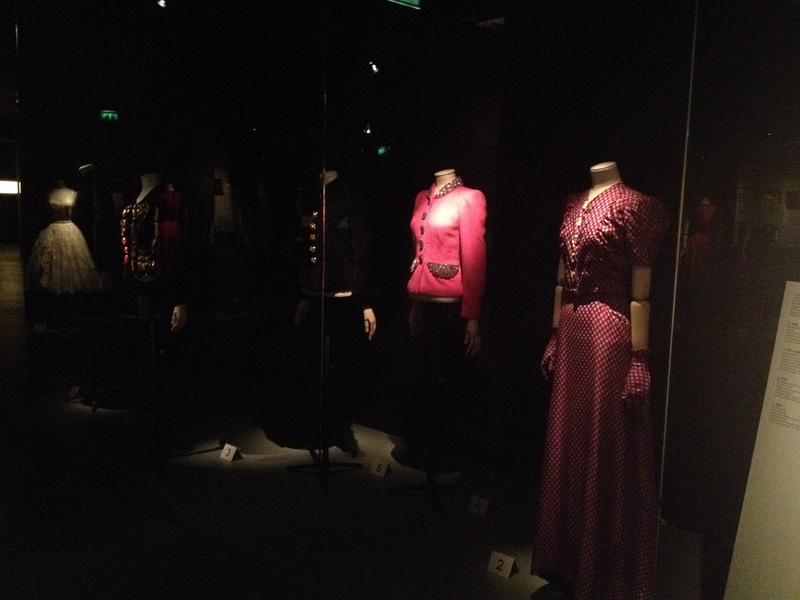 That is not to say that iconic fashion houses pre-1950 are not discussed though. Special emphasis is placed on famous French designer Paul Poiret during the 1910-20s, and the Italian Elsa Schiaparelli who was at her peak in the 1930s. 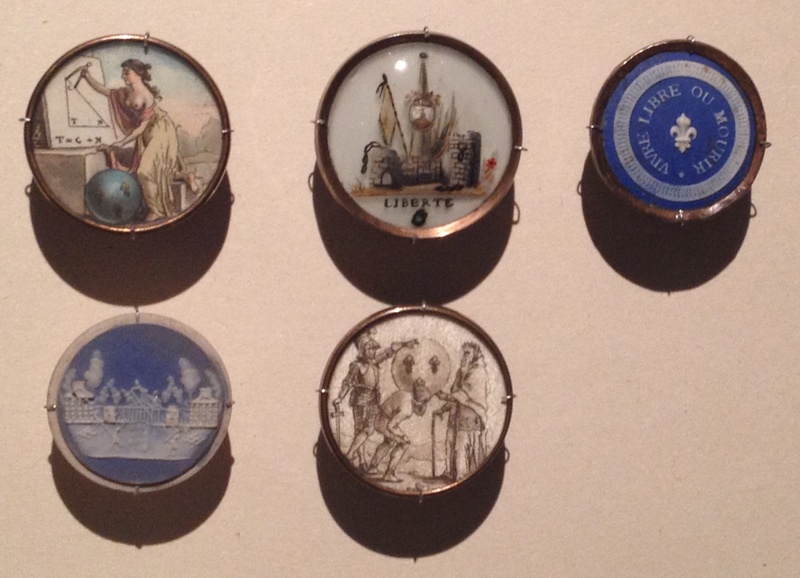 One of the highlights is a collection of 900 different buttons from the workshop of artist and decorator Henri Hamm who was popular among stylish Paristian women in the early twentieth century. As the label to the collection states, “His buttons illustrate his taste for a wide range of materials” and their “decoration is uncluttered but technically skillful, with significant sculptural and chisel work.” The buttons are really very intricate and range from those that are highly stylised to those that depict flora and fauna. Personally my favourite part of the exhibition was the museum’s collection of French Revolution and World War Two Liberation buttons. The French Revolution buttons date to 1789 and depict principle events from the revolution such as the storming of the Bastille or revolutionary slogans such as “VIVRE LIBRE OU MOURIR.” Buttons relating to the French liberation from the Nazi controlled Vichy Regime (so c. 1944) depict the tricolours of France, the British and U.S. flags, as well as portraits of soldiers and resistance fighters. These collections reveal the stylish methods in which buttons, and personal adornments in general, were a means in which to show political allegiance or patriotism during France’s turbulent history. Finally, the exhibition catalogue is beautifully presented and photographed. I also own the catalogue to La Mécanique des Dessous: Une histoire indiscrète de la silhouette, and it is beautifully done as well. Both would make lovely additions to anyone’s collection – whether you’re interested in the articles inside or just the pictures. The exhibition runs from 10 February to 19 July 2015. For more information on the exhibition and the Museum, go to the exhibition page on Les Arts Décoratifs website click here.